‘Saturday Club’ was created by Derry-based children’s media company, Dog Ears, with funding from Northern Ireland Screen. The new original animation series has launched on Hopster TV, a BAFTA-nominated preschool learning and entertainment platform. The preschool show is designed to nurture empathy in young children. ‘Saturday Club’ follows the adventures of four friends – Tian, Jo, Suzie, and Jamie – who meet in a play den each Saturday to discuss their week and play make-believe. Each of the 6 x 3-minute episodes introduces a situation where pre-schoolers have to put themselves in others’ shoes in order to better understand them. 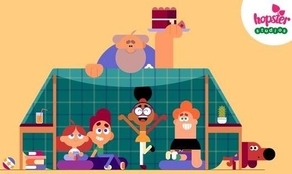 The series is directed by John McDaid (‘Puffin Rock’) and Robin Davey (‘Hey Duggee’) with Ellen Solberg (‘Two Minute Tales’) and Fionnuala Deane serving as executive producers. ‘Saturday Club’, the animation, was made available worldwide from April 1st. It can be found on the Hopster mobile app and on the Hopster channel available on selected smart TVs such as Amazon Fire TV, EE TV and Roku in the UK, Comcast Xfinity, DISH and Sling TV in the US and on many other platforms around the world. Initially exclusively available from the App Store, the Hopster ‘Saturday Club: Empathy game’ lets kids match emotions to expressions, create fun expressions and track their feelings with an emotions calendar.